Bruno Compagnet digs out his old steed to take a trip around the Rioja vineyards. 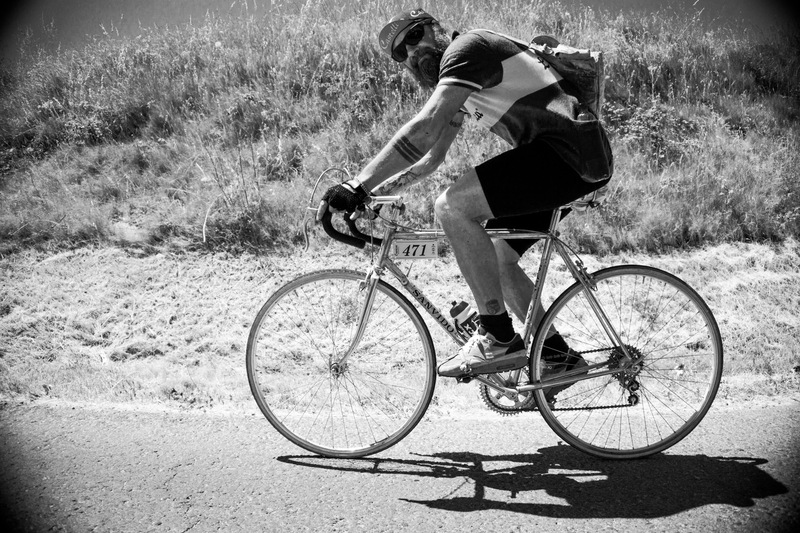 A sweaty beard and bruised buttocks are his constant companions for the convivial kilometers spent pedaling in a peloton of vintage bicycles. My tires bounce dangerously over the stones which litter the road which winds through the Rioja vineyards. I’m alone, sweating, in a landscape which can’t have changed that much since man has been eating bread and drinking wine. We pass though ancient villages with cobbled streets. The crossroads and alleyways whizz by to the rhythm of our pedaling. We struggle to reach the summits of old towns where, inevitably, a church takes pride of place. There are paintings, statues, saints and Madonnas adorned with flowers everywhere on the walls and street corners, marking the Compostella route and reminding me of my Calvary. As we leave one of the villages I lift my eyes to the bright blue sky and the powerful sun makes me grimace. The road snakes and shakes as we’re lead further afield into a mass of olive groves. Once again I ask myself what I am doing here. Good God, what has led me to end up in a situation like this? 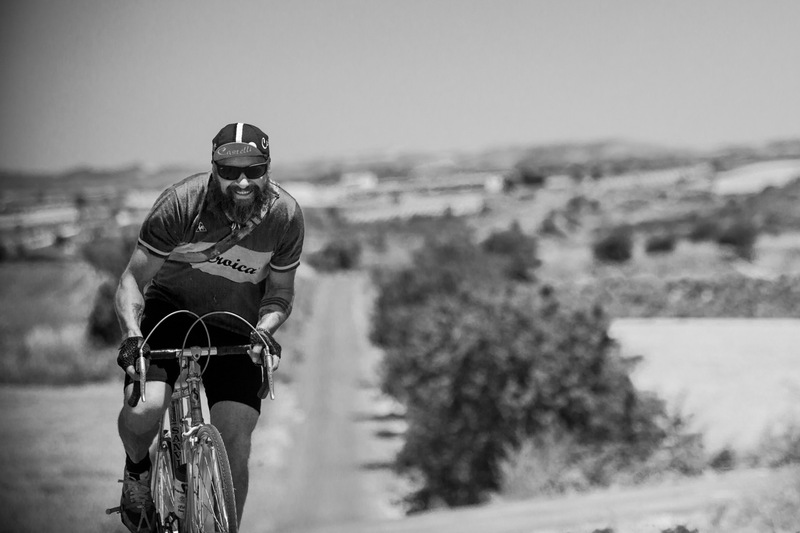 I’m stuck to the tarmac which is melting under the merciless sun and dragging myself to the summit of the hundredth hill when I find a small sign fixed to the trunk of a biblical olive tree: Eroica 60 km. It must be 11.30am. I stop to think and concentrate on my intake of water and sodium pills. I remember my first real sense of freedom: it was in the school yard in Saint Lary, my mother had taken the stabilizers off my small bike and I launched off, unsupported. I discovered an incredible thing that day, a feeling which would stay with me and guide me throughout my life. 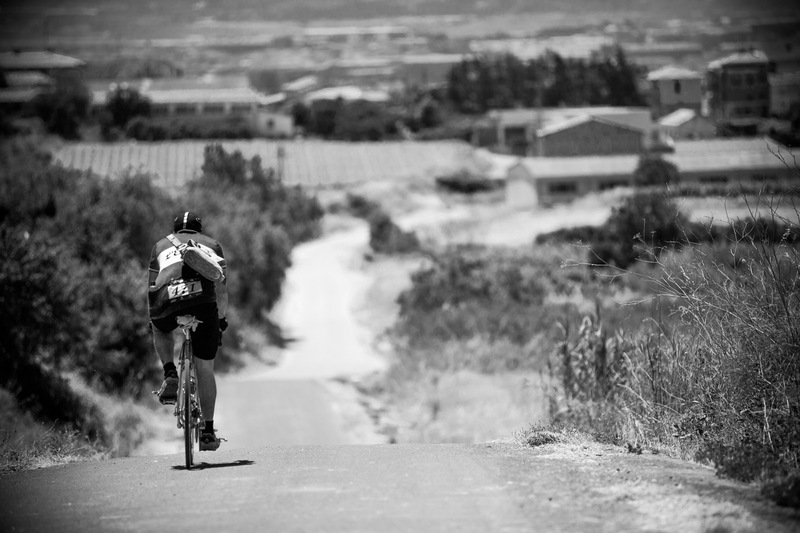 If you’re not a cyclist there’s not much chance that you’ll be prepared to bike 110 km (200 for the big loop! ), half of which on a battered road, with more than 2000m of vert when it’s 30 degrees in the shade… all the while on a bike which is probably older than you. That’s what the Eroica is all about. But with such a good atmosphere, the amazing landscapes and the kind of guys who are pedaling at your side, you crack on and at the finish you are nothing but happy about what you’ve just experienced. Without a doubt I was looking for something a bit rough and ready, something related to my passion for old bicycles, for travel – on the hunt for the more natural, even a tad adventurous, side of bicycling. I also wanted to meet people who enjoy the same simple and authentic things in life, like travelling around a beautiful region on a bike saved from the scrapyard. You get it back in shape little by little, picking up spare parts here and there. It ends up with dodgy brakes, a chain which jumps and punctures regularly…. But at the end of the day you’ve made something which lets you ride. There are moments of grace too – when you soar into a village cheered on by the crowd, decked out in their Sunday best, there to catch the strange spectacle and offer food and drinks to the “campeons!!”. It’s easy to forget that five minutes earlier you were ready to hurl the piece of junk which is between your legs into the nearest ditch. I remembered when, back in the day, my father used to take us to watch the Tour de France at the Col d’Aspin in the Pyrenees, a magical summertime moment when all the kids would proudly don the cyclists’ revolting discarded caps scavenged from the roadside.